A patchwork of scenic natural beauty and abundant cultural and historic sites, Virginia offers many outstanding opportunities to enjoy a road trip or scenic driving tour. In addition to five designated National Scenic Byways, there are several themed heritage and history trails to explore with a day trip, weekend getaway or vacation road trip itinerary. Here are ten of our favorite options. Designed as a recreational motor road connecting Shenandoah National Park and Great Smoky Mountains National Park, the scenic Blue Ridge Parkway is a designated All American Road. Following the high crests of the central and southern Appalachian Mountains for 469 miles in Virginia and North Carolina, the Parkway is the most visited unit of the National Park System. The Virginia portion of the Blue Ridge Parkway is 217 miles long and much of it travels through the George Washington and Jefferson National Forests. Popular places to stop in Virginia include a recreated mountain farm near Humpback Rocks, James River, Peaks of Otter, Rocky Knob Mabry Mill (the most photographed Blue Ridge Parkway site) and the Blue Ridge Music Center. Also, consider one or more of this fun and interesting Blue Ridge Parkway side trips when planning your Blue Ridge Parkway road trip itinerary. Skyline Drive follows a north-south route along the crest of the Blue Ridge Mountains for 105 miles through Shenandoah National Park and is the only public roadway through the park. One of the country's most picturesque drives, Skyline Drive features 75 overlooks with scenic vistas of the Shenandoah Valley to the west or the gently rolling hills of the Virginia Piedmont to the east. Travel along Skyline Drive is leisurely with a speed limit of 35 miles per hour and it takes about three hours of driving time from beginning to end in good driving conditions. Although Shenandoah National Park is open year round, portions of Skyline Drive sometimes may need to be closed because of inclement weather. There are four entrances to Shenandoah National Park, including​ Front Royal near Routes 66 and 340; Thornton Gap at Route 211, Swift Run Gap at Route 33, and Rockfish Gap at Routes 64 and 250. The Rockfish Gap entrance is also the northern entrance to the Blue Ridge Parkway. While only 23 miles long, the Colonial Parkway spans 174 years in terms of colonial history by connecting the historic sites of Jamestown, Colonial Williamsburg, and Yorktown, known as America's Historic Triangle. The Parkway is part of Colonial National Historical Park, a multifaceted unit of the National Park Service. With a speed limit of 45 miles per hour, total travel time to drive the Colonial Parkway is about 50 minutes; however, most visitors will want to spend a day or longer exploring the interesting archeological sites, living history attractions, monuments and battlefields that this fascinating historic area offers. Other popular things to do include park ranger guided tours, hiking, and biking, nature watching, shopping, dining and more. Located primarily in Northern Virginia, the George Washington Memorial Parkway winds along a route that follows the picturesque Potomac River from George Washington's Mount Vernon at the southern terminus northward to Great Falls, Virginia. Carefully planned and designed as a grand gateway to the nation’s capital, the landscaped parkway connects a number of naturally and historically significant sites, including many of the country's most iconic monuments and memorials. Just a few highlights to explore and enjoy along and near the George Washington Memorial Parkway include Mount Vernon Estate and Gardens, Historic Old Town Alexandria, The National Mall in Washington, D.C., Arlington National Cemetery and Arlington House, The Robert E. Lee Memorial and the US Marine Corps War Memorial. In addition, there are several scenic parks, walking, and biking trails and wildlife preserves. This George Washington Memorial Parkway one-day itinerary features many of the top sites. Because the suggested itinerary includes almost 12 hours of stopping time, consider dividing this road trip into two days, with an overnight stay in either Alexandria or Arlington, Virginia. Important Note: The George Washington Memorial Parkway is a major commuter route in and out of Washington, D.C. Weekday rush hour traffic is very heavy and should be avoided when planning your road trip itinerary. The worst of the rush hour usually last in the morning from about 6 a.m. to 9:30 or 10 a.m. and in the afternoon from about 3 p.m. until 7 p.m. Also, note that some bridge heights are too low for trucks to pass beneath. Celebrating and preserving the heritage of authentic mountain music, The Crooked Road is Virginia's Music Heritage Trail. Meander along the winding roads through ten counties in southwestern Virginia's Appalachian region while exploring the roots and traditions old time mountain music. Enjoy country music jams on the porches of local shops and restaurants, browse the workshops of luthiers and fiddle makers, and experience the unique culture and heritage of the region. For a brief Crooked Road sampling, several sites are located near the Blue Ridge Parkway, making this a convenient and unique Blue Ridge Parkway side trip. Or, plan an in depth experience to visit many sites along the approximately 300-mile trail during a weekend or longer driving tour. Home to six American Viticultural Areas (or AVAs) and 200 plus wineries at last count, Virginia's many wine trails offer an array of options for a memorable driving tour. Wine trails are located in every region of the Commonwealth, from the Eastern Shore to the western mountains, near charming towns, historic sites and attractions and scenic vistas. 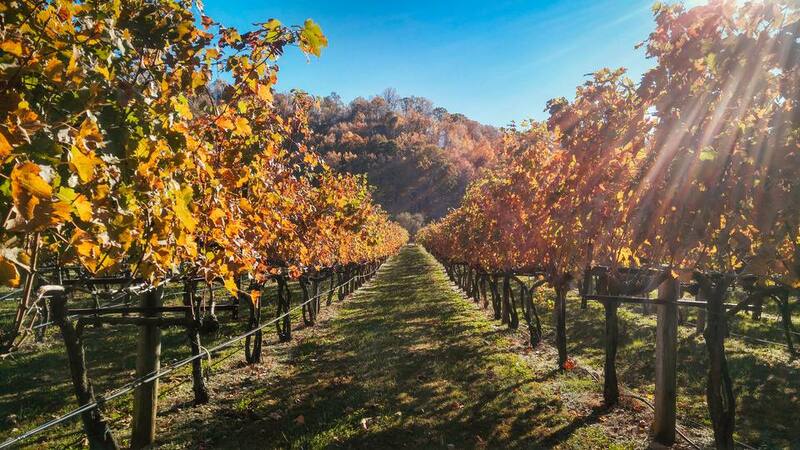 Although wine trails may be explored year round, the month of October, designated as Virginia Wine Month, is one of the best times of the year to plan a Virginia wine trails road trip. In celebration of Wine Month, there are many unique wine experiences, wine festivals, winery tours, travel packages and more planned across Virginia each year. As home to the former capital of the Confederacy and the sites of the first and final major battles of the American Civil War, Virginia has a significant number of key Civil War sites. The Virginia Civil War Trails program consists of five interconnected campaign driving tours across the state, featuring more than 250 stops. Trail routes and stops are marked with interpretive markers and informational trailblazing signs. Maps and brochures are available at visitor centers and online at the following websites. The Virginia portion of the Delmarva Peninsula stretches leisurely along Route 13 from Chincoteague in the northern section to Cape Charles at the southern end, near the Chesapeake Bay Bridge-Tunnel. Visit the famous wild horses of Chincoteague and Assateague, explore quaint coastal villages, enjoy fresh local seafood and visit a few wineries. If time permits, plan to include an overnight visit to Tangier Island (pictured), for a uniquely Virginia experience. The famous 17.5-mile Chesapeake Bay Bridge-Tunnel is well worth a drive across at the start or end of your Eastern Shore road trip. Virginia State Route 5, which connects Richmond and Williamsburg, provides a glimpse of yesteryear as it winds along the scenic banks of the James River past several gracious and storied historic plantations, known collectively as the James River Plantations. Mostly privately owned and having survived three wars, these preserved James River manor houses and plantations recall the sophisticated lifestyle of wealthy Virginia gentleman farmers. Scheduled visiting hours and admission fees vary. (Pictured: Berkeley Plantation, the birthplace of William Henry Harrison - 9th president of the United States).